Trust experts from Team Knowhow, at Currys PC World, to take care of your appliance. 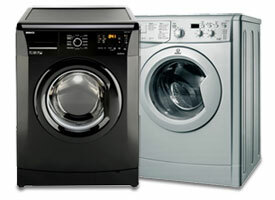 We repair most brands including Beko, Bosch, Hotpoint, LG and Zanussi. Having your washing machine repaired can be a lot cheaper than buying a new one. Our fixed price repair means that you’ll pay one charge that includes the call out to your home, the cost of any parts and all labour charges. We offer a 'no fix, no fee' repair which means that if we find that your washing machine or washer dryer is beyond economical repair*, we’ll give you a full refund. Regardless of where you purchased your washer or dryer, our repair experts are available 6 days a week across most of Ireland, to visit your home to fix your appliance. On the day of the repair, they will ring 30 minutes before to let you know they’re on their way. Our washing machine repairs come with a 3 month guarantee from the date we fix it, which covers you for the fault we repair. For complete peace of mind we offer an Expert Repair which also gives you 12 month’s protection, but covers you for any other faults that may occur including general breakdown. Has your washer dryer stopped working?